For Spring-Summer ‘17, PUMA elevates the game with the Run The Streets campaign. Blurring the lines between performance and style, the new Sportstyle platform introduces street-ready and technically progressive products for those who aspire to own their looks, their city and the moment. Headlining the campaign is PUMA’s newest creative collaborator, Grammy-winning artist, lyrical genius, and style icon Abel Tesfaye a.k.a. The Weeknd. His laidback, streetwise style and swagger is the epitome of Run The Streets, a campaign platform for true individuals seeking streetwear that stands out and performs. These individuals are the boldest on their block, live life at full speed, and always infuse every move with attitude. 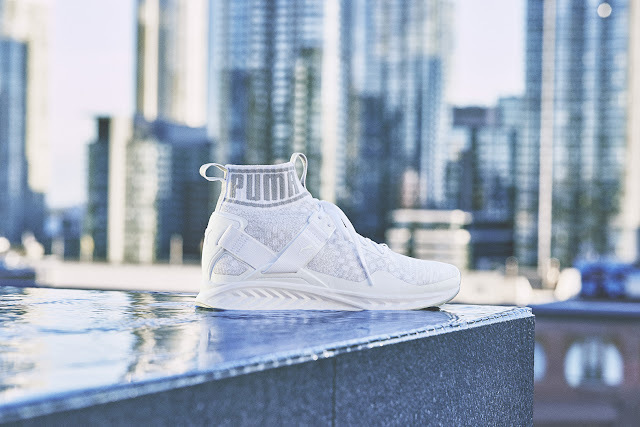 PUMA understand the need for versatility, adaptability and innovation within street style, fusing highly technical innovative sporting features with the attitude of disruptive modern streetwear design. Footwear in the collection includes the IGNITE evoKNIT in new colourways White and Burnt Olive-Forrest Night. 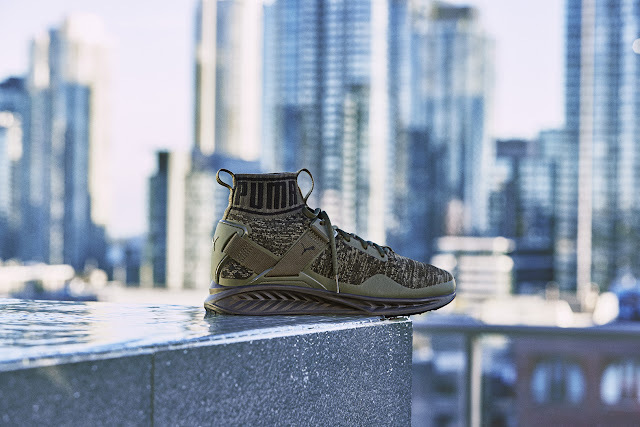 The all-new evoKNIT technology comes with a fully knitted upper for a form-fitting comfort, stretch and breathability, plus a branded, collared sleeve along the ankle for full support and a street-ready look. The upper features a supporting strap that allows stability within the heel to lock it onto the platform of the shoe. The midsole features IGNITE Foam, PUMA’s proprietary material with exceptionally responsive, energy-returning qualities. Furthering the Run The Streets attitude is the IGNITE Limitless sneaker. With its street-inspired design combined with running-approved comfort of the responsive IGNITE midsole, the IGNITE Limitless is tailored for those who run the streets and are always on the go. Luxe detailing, bold branding and aggressive dimensions make this style a true game-changer. Having been teased in The Weeknd’s Starboy video, January sees the limited release of the IGNITE Limitless Hi Tech and Extreme Hi Tech in Black colourway with a wider release in February 2017 with the Core men and women’s pack. The apparel range suits active individuals who take their wardrobe and their workouts seriously. Multipurpose and versatile, it features slick design details, intelligent design hues and technical material mixes. The Evo Image Bermuda, protective and lightweight running-inspired shorts (R1 399). The updated IGNITE evoKNIT (R2 599) drops on Tuesday, 15 November 2016 in PUMA stores, as well as selected retailers throughout the country. The apparel will be available in-store mid February 2017.